Jefferson Junior/Senior High School has seen graduation rates improve since becoming a 7-12 school. 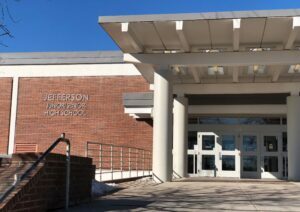 In an effort to continue highlighting the wide variety of choices available to Jeffco students, Jeffco PEN is covering the neighborhood high schools in each of Jeffco’s 17 articulation areas. To learn more about Jefferson Junior/Senior High School (JHS) and the Jefferson Articulation Area, we talked to JHS Principal Michael James. With more than two decades in the education field, James has helmed JHS for the past five years, previously serving as one of the school’s Assistant Principals, and played a critical role in the 2015 reconfiguration of the articulation area. JHS formed in 1955 when two existing schools, the Edgewater Mustangs and the Mountain Wildcats, combined their student bodies. Saint Jeff, symbolizing “the honorable qualities of a fighting spirit,” became the mascot. Fast forward to 2019, and Jefferson Junior/Senior High is poised to benefit from new mill and bond dollars. Fortunately, Jeffco voters approved the $33 million mill levy override and $567 million bond package that will change that. Because JHS shares a border with Denver Public Schools, James said the pay disparity is even more obvious. “5B [the bond] is huge for us,” James said. “5B is all about equity.” The building will receive approximately $13 million in improvements, including new square footage. That means new programming. “We can’t just put programming in, even though it’s the best thing for the students, if we don’t have the facility for it,” James explained. “We’re going to have our facility updated and we’re going to be able to pull programming in that kids never would have had otherwise,” he said. James has been taking his staff through a visioning process as they contemplate just what their $13 million addition might look like and be able to provide. 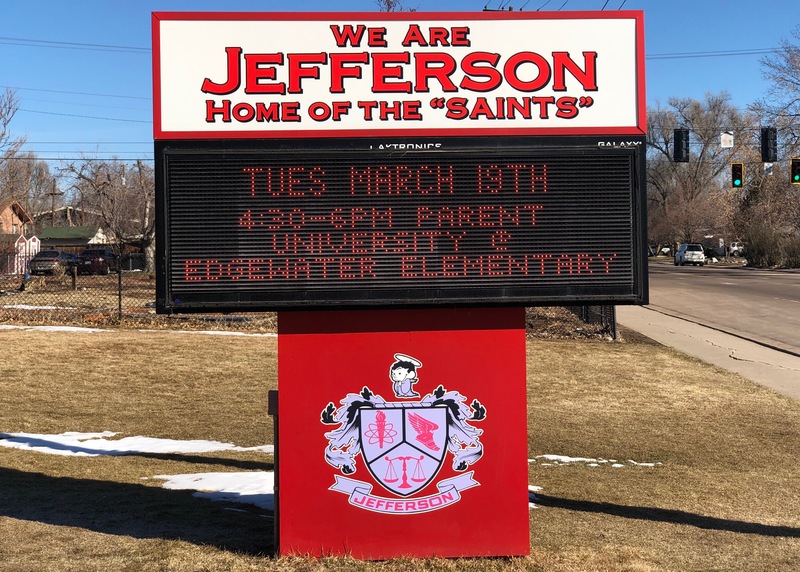 To build on the cohesiveness of the Jefferson articulation area, he will be doing similar work with leaders at Jefferson’s three feeder elementary schools — Edgewater, Lumberg and Molholm. “I’m doing that to ensure that the voices of our kids that aren’t here yet are also able to be a part of that dream, that future planning,” he said. New programming will likely include one of Colorado’s Career Cluster models, making JHS a center for that model. “We are already a dual language strand, but want to be a dual language school based in problem based learning (PBL) which also has one career cluster model and other options within our traditional programming,” James explained. He emphasized that his mission is to add on to programming while not sacrificing anything students already receive at JHS. Currently, the STEM, Arts Design, and Information Technology career cluster is the top choice. “It enables us to have an arts pathway. It enables us to have a STEM pathway,” James said. In March 2015, the Jeffco School Board approved plans to move grades 7 and 8 to JHS, creating a 7-12 model. One of the goals was to limit the number of transitions that highly-impacted students in the Jefferson area would navigate during their time in Jeffco. In August 2015, both the Jefferson area and the Alameda Articulation area became Jeffco’s only K-6, 7-12 grade configurations. James explained that this model helps foster critical connections for students. Since this change, school board members have voted to move all other articulation areas to K-5, 6-8, 9-12 configurations, while leaving Jefferson and Alameda in their current configuration. However, the additional square footage would make it possible to change to a different grade configuration to align with the other areas, James said. “In a new building, if I build accordingly, we should be able to get enough room in that building to account for sixth grade,” he said. The changes seem to be making a difference. JHS’s four-year graduation rate for the Class of 2018 rose to 77.6 percent, compared to 75 percent for the Class of 2017. In comparison, the Class of 2015 had a 64 percent graduation rate. James mainly credits culture and expectations. “It’s making the diploma real, and it’s also creating a school culture that supports these families and these students,” he said. So what makes JHS successful? James added that he wants people to know that while his students accomplish a great deal, those achievements are even more impressive in the context of adversities. Among the adversities his students face are poverty, homelessness, discrimination, losing close family members, and facing other significant challenges in their lives at home. In February, James took his student senate to Washington, DC, where they visited the Capitol, attended a leadership conference, and had a chance to explore the city. Eleven of the 17 students had never been on a plane or traveled outside of Colorado before. “Jefferson kids are resilient and also appreciative of the opportunities and experiences that they get to have,” James said. He added that opportunities like the DC trip are rewards for students who have committed to doing the work expected of them. JHS has also worked to increase the number of students who get to see a college campus each year, and even has a counselor dedicated to helping graduating seniors make the transition from JHS to Red Rocks Community College. “Being able to navigate a new campus, such as Red Rocks, plays a significant role in students’ likelihood of success there,” James said. In addition to the college transition counselor, James has six other counselors: four traditional counselors, a SELS (social emotional learning specialist) and a counselor dedicated to helping students transition into ninth grade. James also invests additional Student Based Budgeting (SBB) dollars to employ three social workers and two psychiatrists on campus. Despite those resources, JHS continues to have additional mental health needs. With more funding, he would invest in behavior interventionists to identify seventh and eighth grade behaviors. Then he would invest in professional development on how teachers can better help those students improve. James would love to offer the same program at JHS, but noted no school can have everything. The partnership with Brady makes a key difference for certain students in keeping them moving forward. After spending time at Brady, James explained the students are reinvigorated and excited to come back to JHS. At that point, he does all he can to bring them back and have them graduate with their class. He also has those students share their experience to try to prevent other students from having to take a similar detour. “Wraparound services are the most important asset to our building as I look at structures that are in place,” James said, and JHS was the first Jeffco school to adopt a Community School model. Community Schools incorporate several pillars, and James explained that JHS focuses most on community outreach. Home visits ensure parents have opportunities to be heard and helped, and monthly accountability committee meetings draw at least a dozen parents. James also makes a point to translate conversations into Spanish as necessary. Another partnership unique to the Jefferson articulation area is the Edgewater Collective. Founded six years ago by Joel Newton to help area schools thrive, the group helped launch the Jefferson Success Pathway, which began with the grade configuration change. Other community members have provided staff lunches on professional development days. They even a car for a student who was previously riding buses for an hour and a half every morning to JHS and two hours back home. That car enabled him to finish school at JHS and attend Red Rocks Community College with a Jeffco Schools Foundation Hero Awards scholarship. Another strength is the alignment of professional development from his three feeder elementary schools to JHS, James said. Some of their collaboration days have included teachers from the elementary schools. “We’ve been very smart about that work,” James said. He and Edgewater Principal Katherine Chumacero also collaborate on a Parent University program, meeting monthly for the past five years with 40-50 families. “We have dinner together, and then we have a lesson we teach,” James said. At JHS, extensive professional development program is based on continuous improvement. “I look at my staff, and they work so darn hard towards common goals. There is no way that there’s any staff that works harder than this team,” he said. Currently displayed on James’ office wall are oversized pages of notes addressing how to effectively start a classroom each day. “That’s my data for what’s going on in the first six minutes of class,” he noted. Recently, he and a team of educators visited 19 JHS classrooms. There they modeled and observed these actions as another example of the continual improvement mindset at JHS. But there are always additional needs. “I am able to make things work because of a combination of my general fund and my grants that we go after,” explained James. He dedicates significant time to do the bulk of the grant writing himself. The district also works side by side with James on bigger funding requests. During Jeffco’s first round of Innovation Acceleration Fund grants, he applied for but did not receive funding for a $75,000 math tutoring program that would have provided two to three tutors in every 7th through 10th grade math classroom. “You just keep doing,” James said. Expanding to a Two-Way Dual Language Program, beginning with the 2019-2020 kindergarten class. The two-way path adds students who mainly speak English to the program. Learning Garden connects soil prep, plant care and consumption to math and science curriculum. Recipient of a grant from the Jared Polis Foundation to purchase an Ozobot EVO classroom kit to teach students at all grade levels how to code. You may also be interested in reading these posts. Kelly Johnson is a Jeffco Schools parent, married to a Jeffco grad and the daughter of two Jeffco Schools grads. 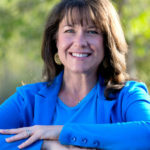 Prior to staying home with her sons, Kelly worked in public relations, specializing in retail, restaurants and crisis communications, and as a local television news producer. Kelly graduated from the University of North Carolina at Chapel Hill with a degree in journalism. Please visit our "About Us" page to learn more about Kelly and our other writers.